This event is 2 hours and on-foot only (no 3-hour or bike option), so the course is especially compact, so expect to be able to visit a bunch of checkpoints in a relatively short distance. 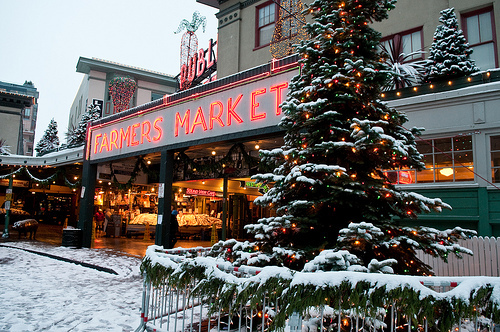 Also, in the spirit of giving, half of your entry fee goes to The Pike Place Market Foundation, which provides vital services to elderly and low-income residents of downtown and welcomes us back each year to Pike Place Market. This year, Pike Brewing Company in the heart of the Market has generously opened their doors to host us in their cozy and nostalgic Museum Room in the The Pike Pub, so it will be easier than ever to grab a warm or cold drink and a bite to eat after your race while you wait for the awards ceremony. Join us at Street Scramble at the Market, the most festive Street Scramble of the year, while helping neighbors in need. Registration closes on Thursday, December 7th, at 11:59pm. Day-of-event registration is available by cash, card, or check made out to Street Scramble. What is Street Scramble? 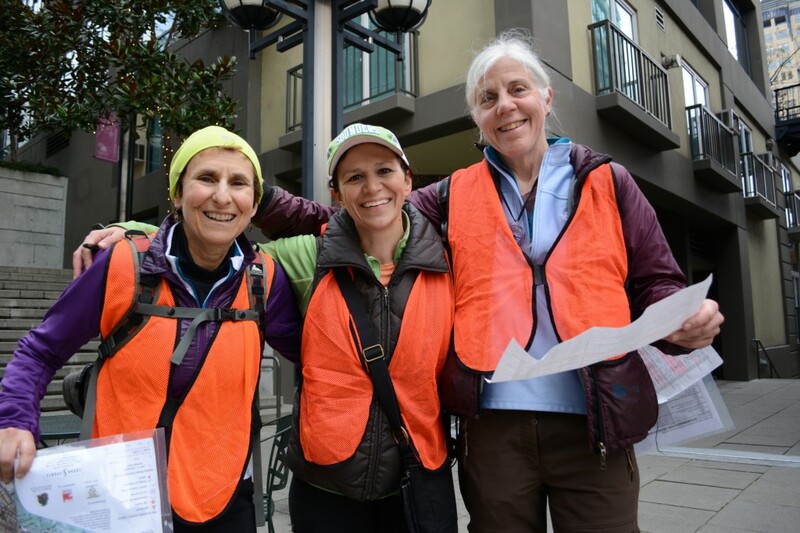 It’s an urban adventure that’s fun for runners, walkers, and families! Dozens of checkpoints are marked on a special map and your goal is to find as many as you can within the time limit. Whether you sprint or stroll is up to you! You can participate solo or in teams of 2-5. Maps are handed out 30 minutes before the race start. Use this time to strategize! Plan which checkpoints you want to find and the route you’ll take to get there. 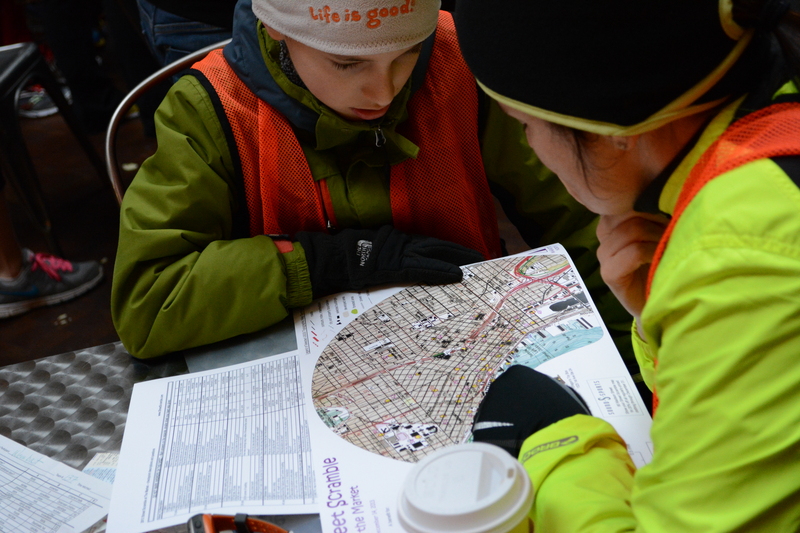 Use highlighters, pens, or pencils to mark your route on the map. Checkpoints have varying point values, this can affect your strategy! After the race briefing, everyone starts at the same time! Do your best to return to the finish on-time and turn in your answer sheet, or risk losing 10 points per minute (or fraction of a minute) that you’re late! This makes for an exciting dash to the finish. To learn more about how it works, including some strategy tips, visit the First Time? page. Wear whatever feels appropriate for the weather and the exertion level you plan. 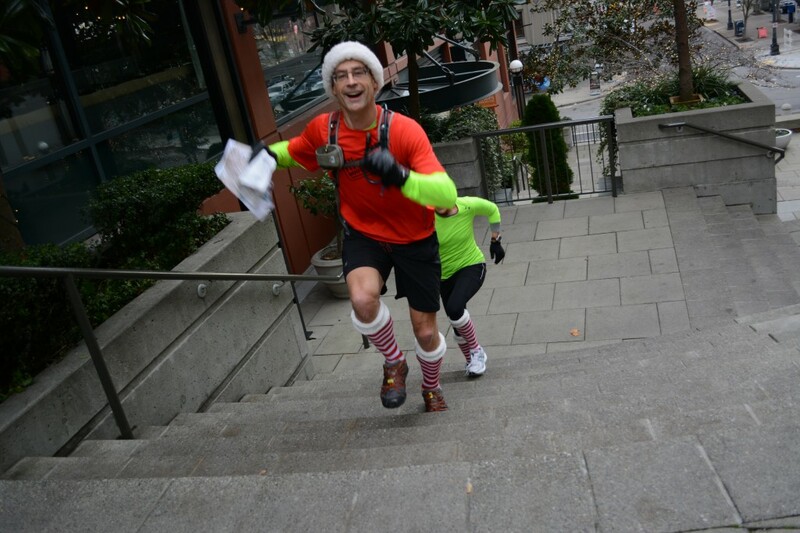 Some participants adventure in their street clothes while others wear breathable running apparel. Whatever you choose to wear, comfortable footwear is essential if you are going out on foot. A compass. This can be handy but is not necessary. A fun team name and/or team costume! The start and finish will be next door to Pike Place Market, at the The Pike Pub, located at 1415 1st Avenue, Seattle, WA 98101. This is just upstairs and a few steps southeast from our usual start location at the Market Theater. Since the event begins before regular opening hours, we’ll be using the entrance from Post Alley, just across from Post Alley Park, down the alley from the Gum Wall and the Market Theater. Street parking is available near the market, but allow time to look around for a spot, since holiday shoppers and tourists will also be coming to enjoy a Saturday downtown. Pay parking is available at Public Market Parking Garage on 1521 Western Ave.
You can also avoid parking altogether by bussing to downtown Seattle! Downtown Seattle is a major hub for bus lines. There are many buses that stop on 3rd Ave, just blocks away from the event start/finish. Use the Google Map above to find transit directions from your home or a nearby park and ride. If you are riding your bike to downtown Seattle, you may find this map of indoor bike parking spots by Seattle Cycling Tours to be useful. The only significant hazard in Street Scramble is vehicular traffic. This is a serious concern if you are trying to be competitive. It is extremely easy to run into the street with your nose in your map. Look before you leap! Orange mesh safety vests with the Street Scramble logo are provided on loan for all Street Scramble events. They are lightweight and breathable. All participants, especially those who are competitive, are strongly encouraged to wear one. If you are running hard, remember to stay hydrated. You may wish to carry water with you.